WebCanDo Blog: Can these Ipad competitors beat Apple? The seven tablets that could..
Can these Ipad competitors beat Apple? The seven tablets that could.. 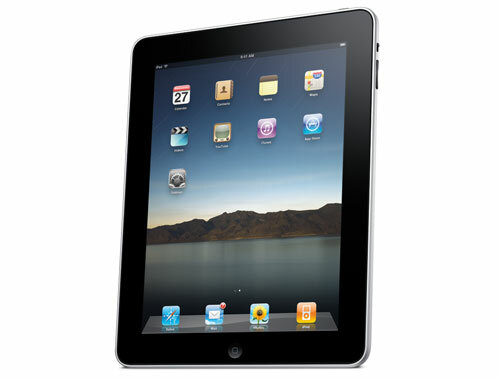 The Apple iPad is the first tablet to sell over 300,000 units in its first day. Industry analysts estimate that the Ipad will sell between 3 and 4 million units in 2010. A huge success, by any accounts. So can the Ipad take off and change the industry? Or do we have another stalking horse tablet that will dominate and make the Ipad take a turn like the betamax? The IPad is a tablet computer meant for internet browsing, media, gaming, and light content creation. Unlike many older tablets, it uses a touchpad instead of a stylus. Released in April, the Ipad bridged the gap between between smartphones and laptops. You can purchase the Ipad in 16GB, 32GB, or 64GB flash drive versions and has a 9.7-inch (diagonal) 1024×768, 132 ppi LED display. The built in 25 watt rechargeable lithium-polymer battery provides up to 10 hours of surfing the web on Wi-Fi, watching video, or listening to music or 9 hours of surfing the web using 3G data network (3G model). You can charge via power adapter or USB to computer system. Apple may have been the first to market and they do have an advantage in this year’s tablet war. But you do have a choice. We have put together 7 potential tablet competitors that will give Steve Jobs a run for his money. These devices are either available or about to launch. So here is a look at some of the upcoming devices that could compete with the Ipad. Microsoft CEO Steve Ballmer showed off the Slate HP tablet prototype briefly at CES this year. The rumors are that Best Buy will have Slate on April 30th. The HP Slate will run Windows 7, setting it apart from the field of tablets running Android. The Slate features a larhe 8.9 inch WSVGS 1024X600 display with pen, touch and digitizer support, the graphics card is an Intel UMA for 1080p playback. The Slate comes with either a 32GB or 64GB flash drive upgradeable via SD card reader. The processor is a 1.6GHz Intel Atom Menlow 2530 processor with 1GB RAM. It offers 802.11 b/g wifi and built in bluetooth combo and optional 3G WWAN. It comes with SD, SDHC, SDXC, 3.5mm headphone/microphone port, 1 USB 2.0, power, audio in/out, and HDMI out ports. The Slate has a VGA webcam (inward facing) perfect for low use video conferencing and a 3 megapixel camera (outward facing). Its main drawback is the power pack, it offers a non-replaceable battery with up to 5 hours of charge time. Dell announced the Streak during the CES 2010 keynote. They said they are working on multiple “upcoming slates,” including one prototype called the Streak. This particular screen is only 5 inches wide, which puts it less in the direct path of the iPad and makes it more akin to the existing line of mobile internet devices. The Dell Streak's 5 inch WVGA screen offers 800 X 400 resolution, Qualcomm's fast 1GHz Snapdragon processor, 256M RAM, 4GB Flash Storage, a 5 megapixel camera and a microSD card slot (maximum 32GB), and a 30pin docking connector. The Streak will also have 3G GSM, Bluetooth 2.1 connectivity, 802.11 b/g Wi-Fi. The Streak may also be come in nine different colors including black, silver, red, purple, blue green, pink and two multicolored designs called Kaleidescope and Sea Sky. Dell is anticipated to launch the Streak this summer, likely running Android 1.6 with a September upgrade to Android 2.1. The newest tablet from Archos, which uses Windows 7 as an operating system, has an 8.9 inch touch screen capable of 1080p HD resolution and a 60GB hard drive. The Archos 9 boasts a number of multimedia functions, including streaming music over the internet, internet radio accessibility and options for web and video chatting. Archos is well known for its portable media players, such as the Android-powered Archos 5 Internet tablet. 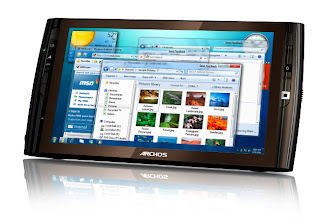 The Archos has a 1.1GHz Intel Atom Z510 CPU, 1GB RAM, 400MHz DDR2, 60GB HD, Intel GMA 500 graphics card, 1.3 megapixel webcam, Ethernet port, PCI-E interface, 1 antenna, supports 802.11b/g and a USB 2.0 port making it compatible with most 3G broadband cards. Though we've squeezed decent performance from the N270/N280 Atoms, as well as from the newer N450 version, any product we've tested with the slower Z-series Atom CPU has been slow. 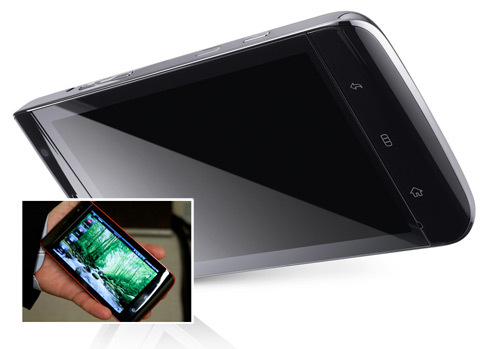 The Archos 9 comes with a 5 Hour removable lithium battery pack. At $549, it's more expensive than the entry-level Apple iPad, but does many things that the Ipad can't, from running Firefox to playing streaming video. The Archos 9 struggles with many basic tasks. If the device offered a better touch screen and a faster processor, it could compete with some of the others in this roundup. 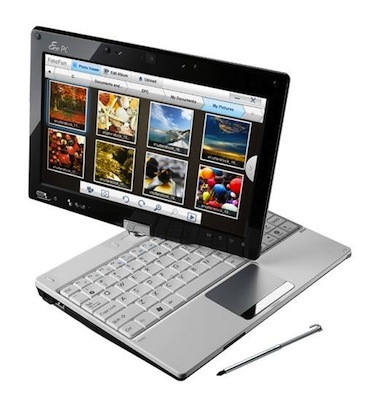 Asus is the company responsible for kicking off the entire netbook craze with its EEEpc series. They were also showing off a prototype of a 9-inch tablet at CES this year. The device has four control buttons reminiscent of the favored layout for an Android-powered phone, leading to the logical speculation that the Asus tablet might well run Google’s mobile operating system. The T91 looks and feels small and light, even for a Netbook. That's because it's built around a 9-inch screen, rather then the bigger 10-inch displays found in most current Netbooks. The obvious compromises, besides the smaller display, are the tiny keyboard and touch pad, but the tradeoff is a system that's very svelte and easy to carry. It's smaller even than the original 7-inch Eee PC. The unit has a Intel's 1.33GHz Atom Z520 Processor and a small 16GD SSD hard drive (plus an additional included 16GB SD card, for 32GB total), 1GB RAM an Intel GMA 500 Graphics card and Windows 7, Wifi b/g/n, Bluetooth, 1 Ethernet and 2 - USB 2.0 ports. The T91 launched in July 2009 and originally launched with Windows XP but now ships with Windows 7 Home Premium. It also offers a unique 20GB of online storage. Cons: Slow processor, lack of storage space. 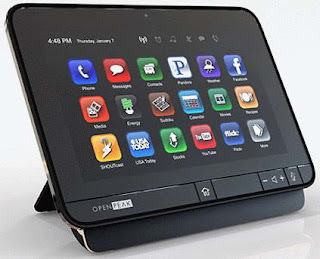 OpenTablet is an exciting multipurpose device with all the benefits and flexibility of a wirelessly connected personal computing and entertainment device. 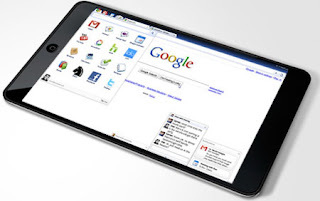 The Opentablet is being marketed as an Ipad alternative to launch in 4Q 2010. The OpenTablet 7 is based on Intel’s Atom Moorestown 1.9MHZ next generation processor, runs a closed Nokia/Intel MeeGo operating system (most likely to change). The unit will offer a 7 inch LED backlit TFT LCD display, Multi touch, 3G GSM, 802.11b/g/n Wi-Fi, HDMI and USB connectivity, 5 megapixel camera and a microSD slot. Cons: Closed operating system, limited details. The Compal features a next generation Nvidia processor that was recently presented at the 2010 CES. The Nvidia Tegra processor has dual core ARM Cortex A9 CPUs which work at a 1GHz clock speed and have 8 different processors. The Tegra processor can handle 1080p HD video, encoding and decoding videos. The processor also supports Adobe Flash 10.1 and the standard Open GL ES 2.0 specs. You can watch HD videos and movies on YouTube and similar websites without a problem. The Compal tablet will feature a choice of either a 7 inch screen with 800×480 pixels or a 10.1 inch screen with 1024×600 pixels. It will most likely include 512MB DDR2 RAM, 4 GB NAND flash memory, Bluetooth, Wi-Fi, 3G and GPS as an optional feature. 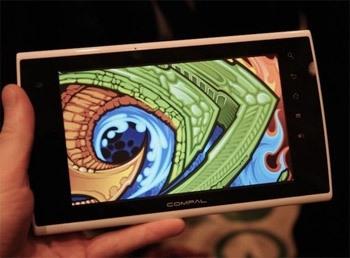 Compal’s Tablet will feature 1.0 Watt Stereo speakers and a 3MP camera. Other features include the Android Operating system, HDMI out, an accelerometer, an ambient Light Sensor, and a Micro SD slot. The Compal is efficient enough to provide roughly 140 hours of MP3 playback and up to 16 hours of HD video on one battery charge. This of course is untested. The Compal tablet won’t be directly retailed to consumers, and is “being currently evaluated by a number of potential carriers”. Don’t be surprised if it is sold by a wireless carrier near you. The device was shown running Android 2.1, and Compal has recently announced that Toshiba has partnered with an estimated delivery date of 3Q 2010. As a simple Web tablet, the former JooJoo may be the most feature-barren of all the iPad competitors, but it's also the closest to actually shipping. The JooJoo priced at is in the same price range as the Apple iPad. The Joo Joo has a 1366 x 768, capacitive 12 inch display, 1.6GHz Intel Atom N270 processor, 1GB of RAM and 4GB solid state drive, WiFi, 1 USB 2.0, headphone and microphone jack. The Joo Joo has full screen Flash video playback support courtesy the Atom processor coupled up with NVIDIA Ion graphics. The 2.4 pound device supports 1080p video streaming, with a Linux browser based OS with icon based shortcuts to Youtube, Facebook, Google, etc. It doesn't help that the JooJoo does not support a card slot for 3G. The JooJoo is available now. All are interesting but not a serious threat. The form factors are too small. Whatever device dominates has to double as usable in the business world in my mind. Only the JooJoo is a contender, but not really, since it is limited in capacity. 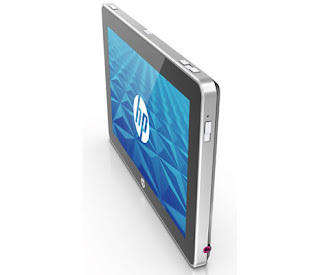 The HP is close, but again the form factor is still a bit too small.